She will tell you that her policies are about caring for low-income workers and giving them a hand up, too bad Kathleen Wynne’s minimum wage boost will actually see tens of thousands of layoffs and other people lose income from reduced hours. Yet somehow, people like me are heartless for opposing an increase to $15 an hour. One reader recently asked me how I sleep at night. Quite well actually, but based on the latest study of her minimum wage plan, the premier and low-income workers should be worried. Right now Ontario’s minimum wage is $11.40 an hour, it’s scheduled to rise to $11.60 per hour next month and then continue with annual, predictable increases each October. 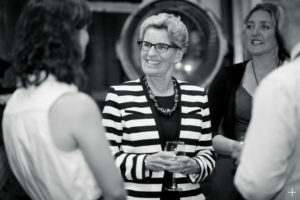 But suddenly, with her political fortunes falling, Wynne decided to back an almost immediate increase to $14 an hour, scheduled to take place this coming January 1, and another increase to $15 on January 1, 2019. This week, Ontario’s Financial Accountability Office, a nonpartisan watchdog set up by Wynne herself, released a report saying that even after accounting for any new jobs created by increased spending due to the wage hike, Ontario would lose 50,000 jobs at least as a result of this plan. “However, there is evidence to suggest that the job losses could be larger than the FAO’s estimate,” the report reads. As for reducing poverty, since most people earning minimum wage are students, young people living at home with their parents or a secondary income in a house, the impact on poverty would be low. “Since the income gains would not be concentrated on low-income families, raising the minimum wage would be an inefficient policy tool for reducing overall poverty,” wrote Financial Accountability Officer Stephen LeClair. So 50,000 jobs, the equivalent of the entire city of Belleville, could be lost and it will be an inefficient tool for reducing poverty. Why on earth is this being done then? Electoral politics and votes, many like the reader that asked how I sleep at night don’t think of the lost jobs, the lost hours or the real distribution of that income. Even for those that don’t lose their jobs, the experience from Seattle says many could lose income. Seattle city council ordered all businesses in their jurisdiction to move to a $15 an hour minimum wage. Then they commissioned a study after the fact. Seattle hasn’t even reached $15 an hour yet and won’t do so until 2021 but the impact is already being felt. The study from the University of Washington found about 5,000 fewer low wage jobs in the city and a 9 % reduction in work hours for low wage workers, translating to a loss of income of about $125 per month. One of the studies authors put it in stark terms to The Seattle Times. And still Ontario marches ahead, the Liberals saying that anyone that doesn’t back the pay hike lacks compassion and doesn’t care about low-income workers. How much will the premier care when her policy sees 50,000 workers unemployed and tens of thousands of more unable to pay rent. Wynne isn’t doing this to be compassionate, she’s doing it for the worst reason of all, to save the only job that matters in her mind – her own. At least it means 50,000 less votes for her and her gang of slugs! Nobody is talking about the dishwasher who will soon to make more than the saute cook, does saute cook now at $14/hr get $3/hr raise from $14/hr to to $17/hr and so on and so on? The destruction of Ontario has been in full speed more so under Crime Boss Wynne. Activists is the worst kind of government. 50,000 unemployed workers? You know, I’ve seen numerous articles with this number bandied about, that its almost become a defacto — in that it likely isn’t true since the first time it was used. And, it hasn’t been proven.